The Mastermind Genomic Search Engine has indexed the full text of millions of genomic articles and supplemental data to provide immediate insight into the published research for every disease, gene, and mutation found in the literature. Mastermind is used by hundreds of diagnostic labs around the world to accelerate genomic interpretation and by pharmaceutical companies in drug discovery for its comprehensive genomic landscape of every disease. Aggregating the granular genomics data allowed us to see the bigger-picture patterns that emerged. 2017 findings: Newly-emergent variants were predominantly associated with cancer, and research was predominantly focused on resistance mechanisms or the development of new therapeutics. 2018 findings: A continued trend of studies and new discoveries detailing drug resistance mechanisms, with several of the previously identified emerging variants re-appearing on the list of the top 300 newly discovered variants; an increasing number of emergent variants were found in non-cancer diseases. Notable results are summarized in Tables 1 and 2. Prevalent on this list are variants that drive multiple resistance mechanisms to tyrosine kinase inhibitors: BTK p.C481F, p.C481R, p.C481Y and p.L528W in addition to CCND1 p.E36K that inhibit Ibrutinib; EGFR p. L792H and p.L789I shown to inhibit Osimertinib and Rociletinib, respectively; and resistance variants in ABL1, ALK, ERBB2, NTRK3 and ROS among others (see Table 1). EGFR p.L792H confers resistance to Osimertinib in patients with non-small cell lung cancer (Zhang et al. 2018) and has been found to co-occur with EGFR p.C797S (Yang et al. 2018), as described last year as a newly emerging variant associated with resistance to several tyrosine kinase inhibitors (Avizienyte et al. 2008). Table 1. Representative emergent variants (newly discovered from 2016 onward) that are associated with cancer and the study of resistance mechanisms or the development of therapeutics. Hyperlinks within citation count show publications for each variant in Mastermind. NSCLC – non-small cell carcinoma. CLL – chronic lymphocytic leukemia. CML – chronic myelogenous leukemia. MCL – mantle cell lymphoma. Among the emerging variants are variants that cause Activated PI3K-delta Immunodeficiency Syndrome or variants that are strongly associated with influencing body mass index (BMI) such as the variant CREBRF p.R457Q published in Nature Genetics (Minster et al. 2016). HSD17B13 rs72613567 is a loss-of-function variant in HSD17B13 that reduces the risk of non-alcoholic and alcoholic liver disease and cirrhosis as well as reduces the risk of progression from steatosis to steatohepatitis (Abul-Husn et al. 2018). ADCY3 c.2433-1G>A disrupts a splice acceptor site causing decreased expression of ADCY3 and is associated with an increased risk of obesity and type II diabetes in the Greenlandic population (Grarup et al. 2018). Table 2. A sample of the emergent variants (newly discovered from 2016 onward) in 2018 not associated with cancer. Hyperlinks within citation count show publications for each variant in Mastermind. Taking a step back and looking more broadly at the gene- and disease-level of the newly emergent variants in aggregate, the pattern of emerging research interests as a whole underscored the trends illustrated above: cancer-associated genes for which resistance mechanisms have been identified and genes and diseases associated with rare genetic syndromes dominated the list. The Top 20 Genes associated with the 300 most emergent variants comprised less than 25% of these genes, highlighting the great variety of genes for which newly discovered variants have been described. In contrast, the Top 20 Diseases represented about 75% of emerging gene-based research, with approximately 40% of these being malignant and 60% non-malignant. This result further illustrates the trend towards an increase in rare disease studies focusing on genomic research. Figure 1. 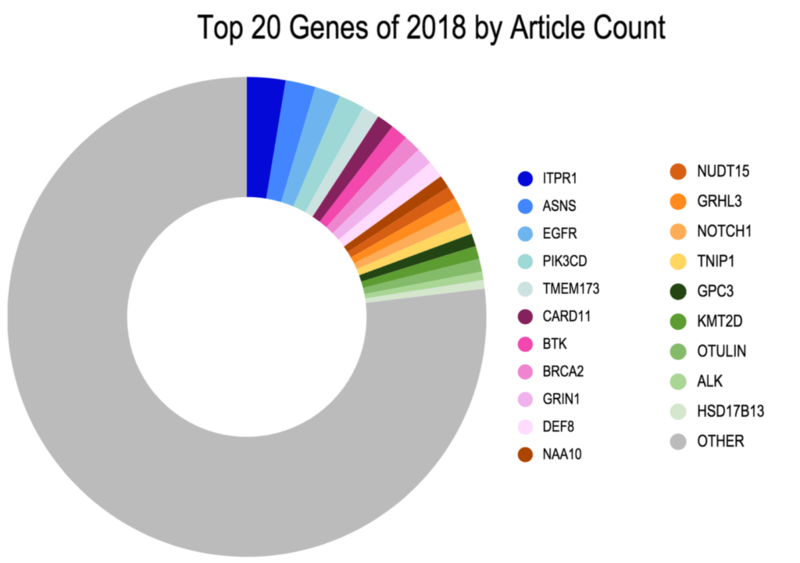 The Top 20 Genes associated with newly emergent variants as published in the literature between 2016-2018. In total, 241 unique genes were identified with the 300 newly emergent variants. The most widely cited gene associated with newly emergent variants was ITPR1, an inositol1,4,5-triphosphate receptor, associated with spinocerebellar ataxia type 29 (Ando et al. 2018; Casey et al. 2017; Zambonin et al. 2017) or Gillespie Syndrome through both recessive and dominant mechanisms (Gerber et al. 2016). The next most widely cited gene on the list was ASNS, the asparagine synthetase gene mutated in the metabolic syndrome ASNS-deficiency first described in a number of case reports in mid to late 2016 and increasingly cited in the literature (Seidahmed et al. 2016; Sun et al. 2016; Yamamoto et al. 2016). Rounding out the top five is the stimulator of interferon gene (STING) family member, TMEM173 found to be mutated in STING-associated vasculopathy with onset in infancy (SAVI; Melki et al. 2017) and chilblain lupus (König et al. 2016). Figure 2. 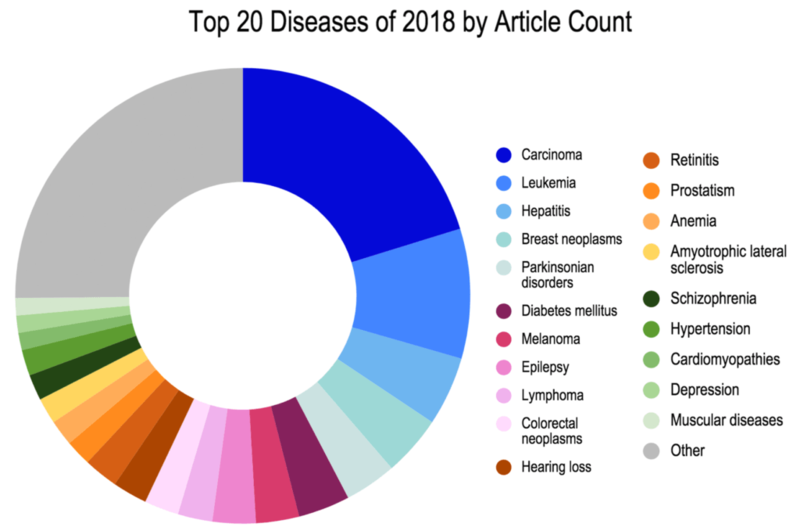 The Top 20 Diseases associated with newly emergent variants in literature published from 2016-2018. In total, 48 unique diseases were identified to be primarily associated with the 300 newly emergent variants. A number of newly emerging variants were associated with a variety of different carcinomas and leukemias/lymphomas. A synonymous variant in SLC16A11 originally identified in large-scale screening of Mexican populations to identify associations with Type 2 Diabetes was originally published only in supplemental materials (SIGMA Type 2 Diabetes Consortium et al. 2014; Huerta-Chagoya et al. 2015) and is newly emergent as a focus of interest in 2017 articles (Rusu et al. ; Miranda-Lora et al.). This variant was found to influence the extent of SLC16A11 transport activity in concert with other associated variants. Other highlights include a number of early onset Parkinson’s disease associated variants identified in multiple genes including DNAJC6 p.R927G (Oligatti et al. 2016), PARK7 p.L172Q (Taipa et al. 2016), and SYNJ1 p.R459P (Kirola et al. 2016). The 2017 study illustrated the nature of the disease-variant landscape by identifying the top 10,000 most widely mentioned clinically significant variants and mapping them over time by publication date. The Top 10 Cited Variants in 2017 were found to be BRAF p.V600E, EGFR p.T790M, JAK2 p.V617F, HFE p.C282Y, EGFR p.L858R, KRAS p.G12D, CFTR p.F508del, KRAS p.G12V, BDNF p.V66M, and SNCA p.A53T (ordered based on most widely mentioned to least mentioned). 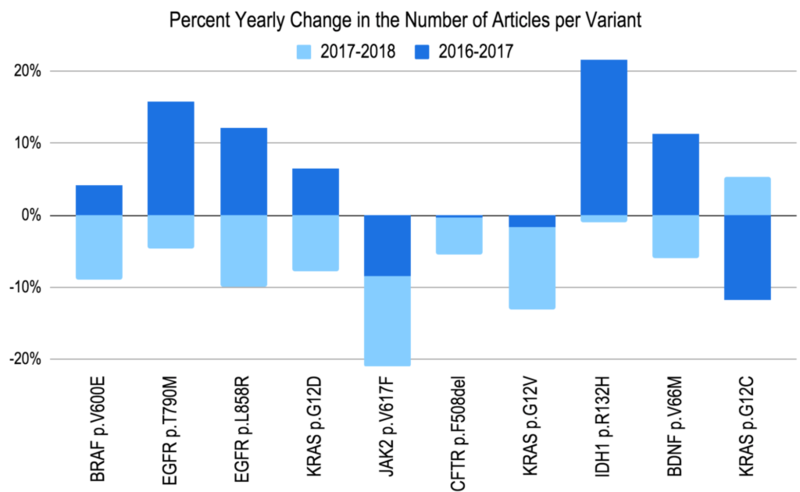 Revisiting these data in 2018, all of the previously top cited variants experienced a decrease in the number of publications in 2018, with some variants having already experienced a decrease from 2016 to 2017 (see Figure 3 for more details). This surprising trend suggests that these widely published variants may be reaching a saturation point in the genetic literature. In other words, the variants are well-studied enough that publication rates have begun to decline while other newly discovered variants for a more diverse collection of genes and diseases are getting more attention. Figure 3. The top 10 most widely cited variants of 2017, versus the percent change in the number of citing articles over two years: 2016-2017 (dark) and 2017-2018 (light). By utilizing the Mastermind database, an increasingly diverse array of newly emergent variants has been discovered and described in the scientific literature. This data showcases a shift of focus away from previously well-characterized variants that have been known for many years, and from a singular focus on cancer towards the inclusion of an increasingly broad array of variants in many more types of genes and a greater number of constitutional diseases, including rare genetic disorders. As such, the newly emergent cancer-associated variants tend to be associated with resistance mechanisms. This insight highlights the likelihood that they are newly appearing in nature as opposed to being newly discovered (as would be expected of the variants associated with constitutional diseases, for which the absence of treatment pressures does not lead to disease evolution in the form of new genetic variation). Discovering and characterizing these drug resistance mechanisms in cancer will likely remain a prominent component of genomic research for the foreseeable future. The analysis, as performed within this review allowed us to uncover interesting epidemiological patterns as they emerge. It will be interesting to see how these trends expand and evolve in future years. For clinical practice, the recognition of these new resistance mechanisms in cancer and newly discovered disease-causing variants in rare disease will surely inform patient care, and highlights the need for practitioners to stay abreast of the literature much more faithfully than in years past. Overall, the data presented here suggests that the diversifying landscape of genetic research foreshadows a substantial increase in the development of personalized medicine for rare diseases and drug resistance in the coming years. The content as presented in this article is a current variant, gene, and disease trends analysis as of January 2019, and provided by Genomenon team members Nathan Adams, Lauren Chunn, Mark Kiel, and Diane Nefcy. This study was also published in EnlightenBio in collaboration with Brigitte Ganter. Mastermind, Genomenon’s Genomic Search Engine, provides immediate insight into the published genomic research for every disease, gene, and genetic variant found in the literature. Used by hundreds of diagnostic labs around the world, Mastermind accelerates genomic interpretation by providing unique insight into genomic relationships found in the full text of millions of scientific articles. Pharmaceutical researchers license the Mastermind database for a comprehensive genomic landscape associated with any given disease – to identify and prioritize genomic biomarkers for drug discovery and clinical trial targets. Mastermind Alerts provides automatic notifications of new articles citing requested genes, variants, and diseases on a weekly basis.